This item can be special ordered, please let me know if you are interested. Minimum purchase required. 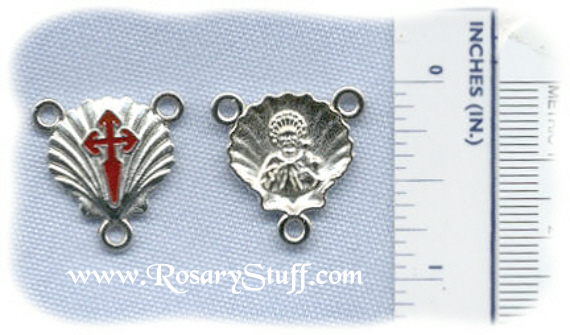 Chinese silver plate Scallop Sea Shell rosary center with red enamel cross on the front. The scallop shell is not only a common symbol for baptism but also has ties to St. James the Greater (one of the 12 apostles). The front of the center features a red enamel Cross of Santiago de Compostela, while the image on the back is most likely of St. James (it also looks like someone performing a baptism, unfortunately my supplier is unable to confirm for me the exact details). Sized at a little over 3/4 inch tall (including rings) and 3/4 inch wide (including rings).